The Center for an Urban Future (CUF), a nonpartisan policy organization, released a report in April of this year purporting that internal practices within several New York City agencies are partially to blame for the deficiencies of public construction projects. Titled Slow Build, the document outlines a variety of findings related to the schedule and budget of capital projects, including the revelation that the median duration for a cultural project is seven years and costs nearly $930 per square foot to build. The Department of Design and Construction (DDC) and the Office of Management and Budget (OMB) oversee capital projects for the city. According to the report, these agencies utilized inefficient systems and protocols that are in need of a policy overhaul to improve project delivery. The report, produced in collaboration with Citizens Budget Commission, analyzed the details of 144 library and cultural buildings that were completed between the 2010 and 2014 fiscal years, supplemented by dozens of expert interviews. Among the claims made, the report found that “86 percent of delays occur before construction begins, with many projects getting tripped up in the initial scoping and design phases.” This suggests that extensive reviews for public projects and inaccurate cost-procurement processes are a major source of the problem. The report also identifies city-initiated scope alterations, which often lead to costly and prolonged change orders during construction, as contributing factors to the delays. In addition to the bureaucratic logjam, the report also draws attention to certain state laws “that both mandate a low-bid procurement system and prevent city projects from adopting a design-build process.” While many of the report’s recommendations include streamlining municipal procedures, CUF also suggests a loosening of state laws to accommodate less restrictive procurement practices for public buildings. This suggestion is not out of the question as New York Governor Andrew Cuomo did sign into law design-build protocols for infrastructure-related projects in 2011. However, these changes to architectural contracts would require stronger advocacy by city leaders, political capital which has not yet materialized. 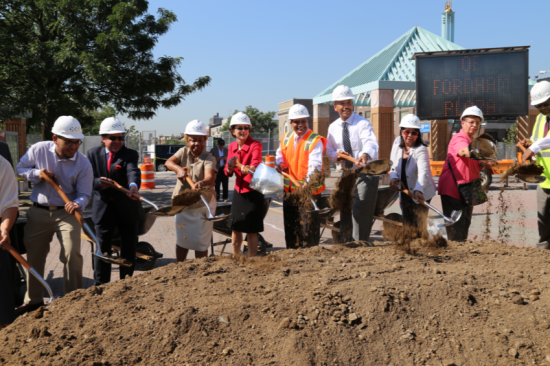 Not only is 2017 a mayoral election year, but recently the former DDC Commissioner Feniosky Peña-Mora was forced to step down amid controversies related to delays in Hurricane Sandy–rebuild efforts that have long been overdue. It is unlikely that this issue will attract much attention in the coming months. It is critical to note, however, that this survey includes projects largely shepherded by the Bloomberg administration and did not review the policies, initiatives, or funding practices of the current administration. 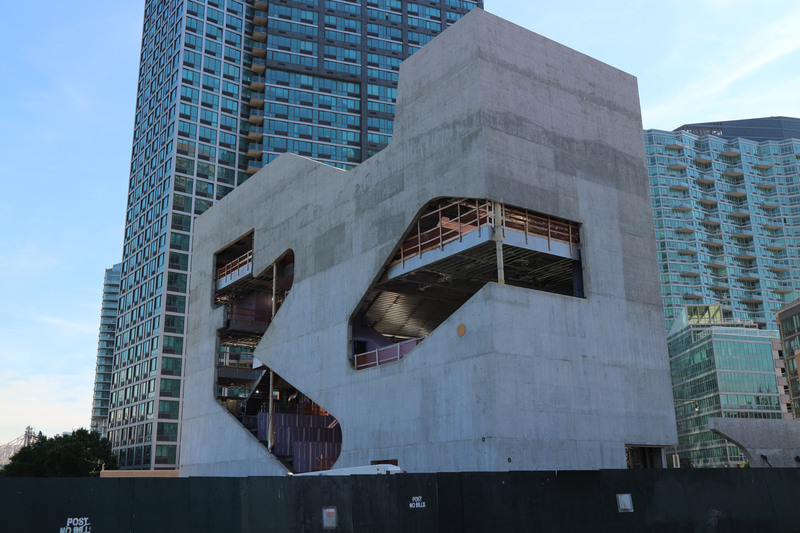 The Hunters Point Community Library by Steven Holl, for instance, has been in the pipeline since 2008 and just recently experienced another delay regarding an unforeseeable glass shipment fiasco from Spain. For its part, the city appears to be making moves to rectify some of the concerns raised in this report. A spokesman for the DDC cited that since July 2014 procurement durations have been reduced from an average of one year to nine months, and that project durations have shortened by up to 40 percent. The spokesman also highlighted a new division of the DDC called Front End Planning Unit that “[ensures] that the scope of work and budget meet necessary requirements” before a project is accepted. The program was originally launched in 2004 and has included firms such as Bjarke Ingels Group, Steven Holl Architects, and Diller Scofidio + Renfro. Now the list of 26 companies is subdivided into four sections by project scale allowing for more competition among the firms, ensuring that the right team can handle the scope of the projects. DCE 2.0 is an effort by the agency to address not only the quantifiable metrics of project delivery addressed by CUF, but also the qualitative role that architects play in the delivery of public buildings. I deeply appreciate Feniosky Peña-Mora’s extraordinary service to New York City. From his work awarding nearly $1.2 billion in M/WBE contracts, to instituting wide reforms that have already made the agency more responsive, to improving our response to Hurricane Sandy, he made our City a better place. He navigated the agency through a period of robust growth, overseeing more than 860 construction starts and completions valued at more than $9 billion—all while winning more than 80 design awards and helping 1,600 students participate in DDC engineering programs. This is impressive stuff. While I am sorry to see him go, we did know this day would come. Indeed, he put off his return to Columbia, where he is a tenured professor, for an additional year to continue to serve the city. As we search for an equally strong candidate to run this critical agency, I thank Feniosky Peña-Mora’s for his service. He is the latest city official involved in the problem-riddled Build it Back program to step away, and also came under fire for his hiring of a councilman's wife and for awarding city contracts in a quid-pro-quo for extremely positive press coverage. Missed the FDNY's smoking-hot firefighter calendar? Too old for Lisa Frank? Need an upgrade from puppies and kittens? 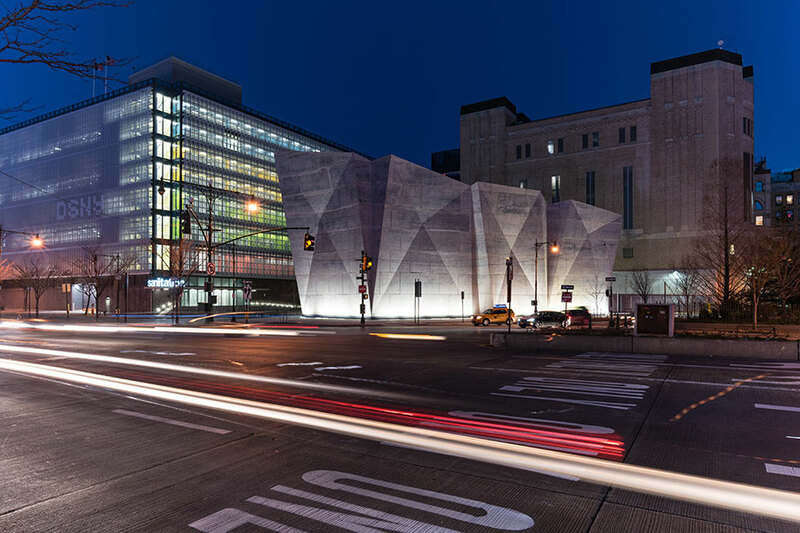 Fear not—the Department of Design and Construction (DDC) has released a very sleek 2017 calendar featuring New York's newest public buildings. The city's capital construction agency is responsible for bringing hundreds of municipal projects to life, above- and below-ground. 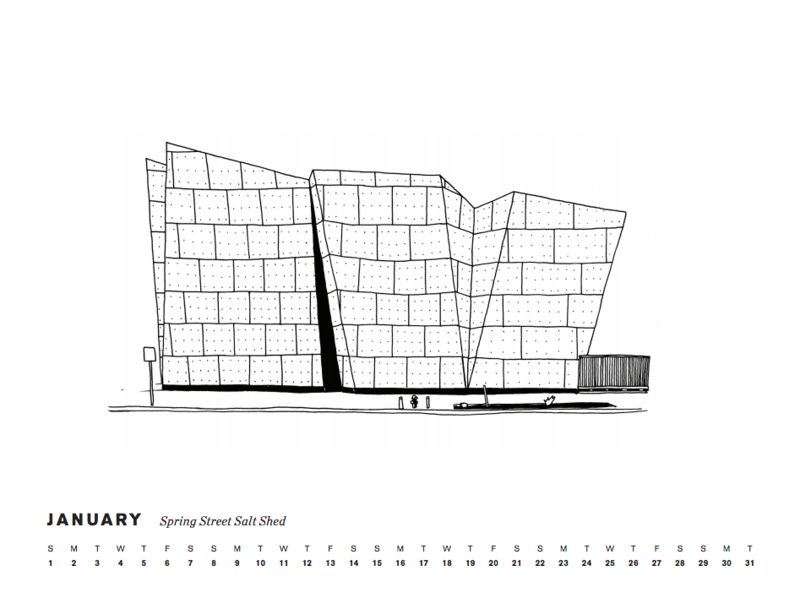 Next year's calendar showcases some recent projects in clean black-and-white line drawings: Dattner and WXY's acclaimed Spring Street Salt Shed leads off, while SOM's disaster-proof emergency call center and the agency's own Fordham Plaza revamp close out the year. Take a look through the gallery above to see all featured buildings (plus boats and art, too). 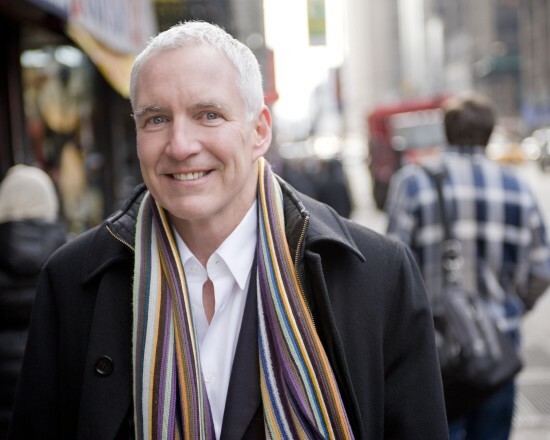 James S. Russell has been appointed the Director of Design Strategic Initiatives at the New York City Department of Design and Construction. 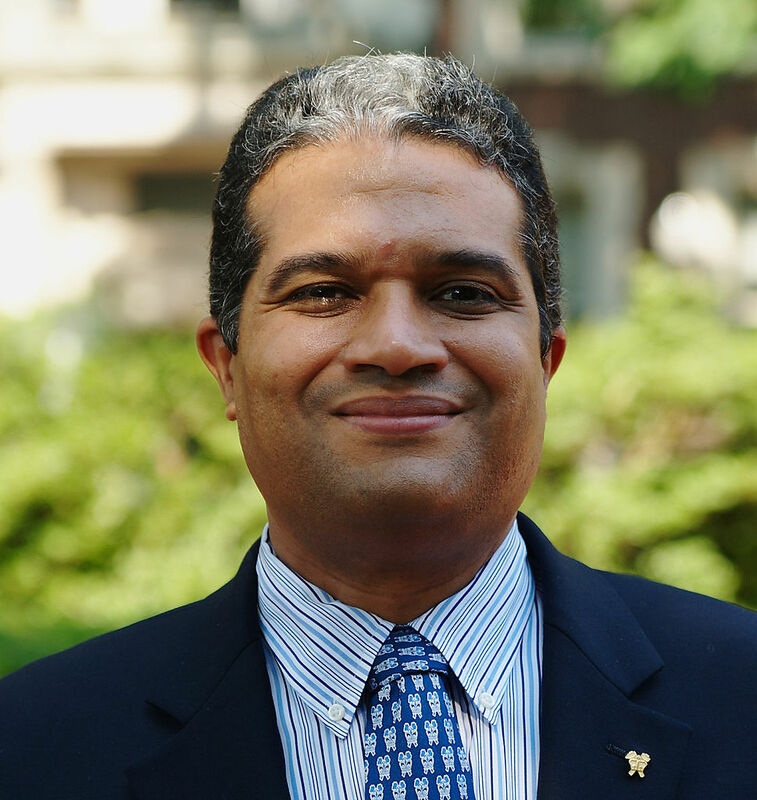 Leading a research team, he will help the agency to build its already impressive capacity to deliver equitable growth through environmental sustainability and resiliency. It would seem that the the once humble blue stone, quarried in New York State, is getting some renewed respect. We recently saw it cleverly cladding 41 Bond by the design-build firm DDG Partners, now artist Nobuho Nagasawa it calling attention to it underfoot in Red Hook, Brooklyn. Nagasawa's installation elevates an everyday visual experience to the level of art, namely tree shadows on a Brooklyn blue stone sidewalk. 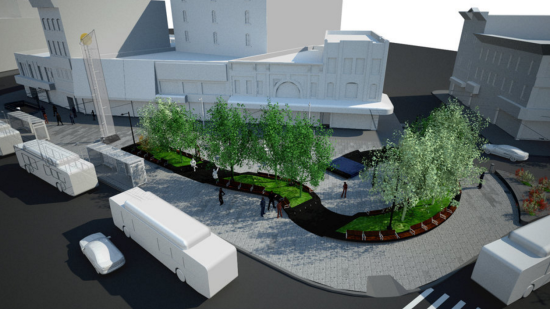 Incorporated into the DOT's reconstruction of Columbia Street, "Timecast" was funded through the Percent for Art Program and its installation was overseen by the Department of Design and Construction (DDC). The installation is a component of the Brooklyn Waterfront Greenway Initiative which connects the waterfront from Greenpoint to all the way Sunset Park, including Columbia Waterfront District. The blue stone was fabricated and sandblasted by Brooklyn-based Ottavino Stoneworks and DDC made sure to repour the concrete surrounding the blue stone, so as to ensure an undisturbed visual flow. 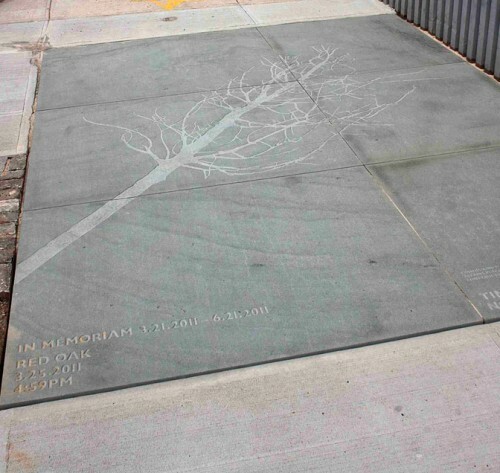 In her artist statement Nagasawa said that by planting native trees and etching the traced shadows onto the New York stone, the project aims to memorialize local history. As the young trees grow they will become a "fixed marker of change" in the evolving neighborhood and will inspire people "to think about their own presence over time." Thursday was a great night for New York showroom events. AN took advantage of the beautiful fall weather and made the rounds. 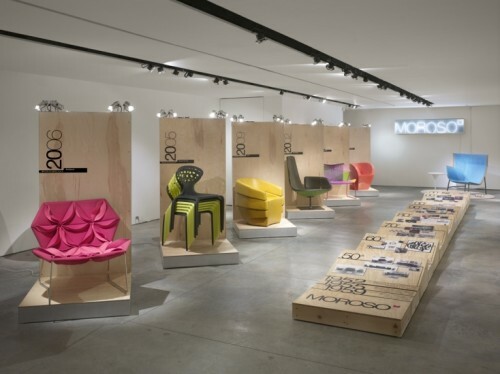 Here are some highlights: Moroso Traveling Show Moroso celebrated the NYC launch of its traveling show commemorating 60 years of great furniture-making history. Designed by Rockwell Group, the pop-up exhibition will tour New York through November 26, then continue on to Chicago, Philadelphia, Miami, Dallas, Los Angeles, Atlanta, Seattle, and Vancouver. The show features 25 pieces from the Moroso oeuvre, many positioned on raw wood displays next to a timeline illustrated with images and drawings from the company’s archives. New Marazzi Tile Showroom NY Stone Manhattan unveiled its new second-floor showroom dedicated to products from Italian tile manufacturer Marazzi, which will be NY Stone’s only tile supplier. Oysters and appetizers from Le Cirque helped the tiles make a swanky splash in the high-ceilinged space, which features architectural tile and interior porcelain stoneware. DDC’s Venini 90th Birthday Celebration The DDC Gallery celebrated Venini’s 90th anniversary with an installation of the Italian glass-makers work, including recent pieces designed with Dutch design team Studio Job. In addition to the presence of Job Smeets and Nynke Tynagel, dazzling Arnolfini chandeliers and whimsical standing lamps lit up the DDC’s Madison Avenue showroom. Approximately six years after Thomas Phifer and Partners, the Office for Visual Interaction, and Werner Sobek won the CityLights competition for a new standard streetlight, some of the first examples are popping up in Lower Manhattan. 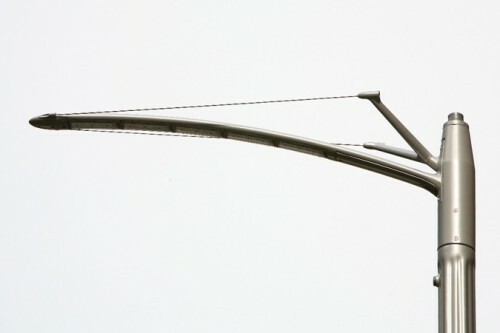 The design for LED streetlights was cutting edge at the time, and the technology was very expensive. Prices for energy efficient LED's have fallen considerably since then, allowing the ultra slim fixtures to find their way onto city streets. 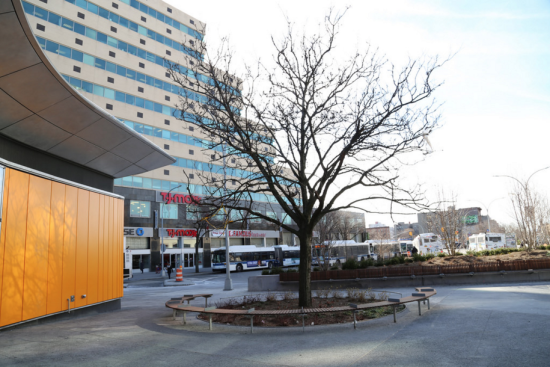 The Bloomberg administration has changed New York's scrappy streetscapes in numerous ways, including adding new pedestrian plazas and hundreds of miles of bike lanes, and commissioning new street furniture and newsstands. 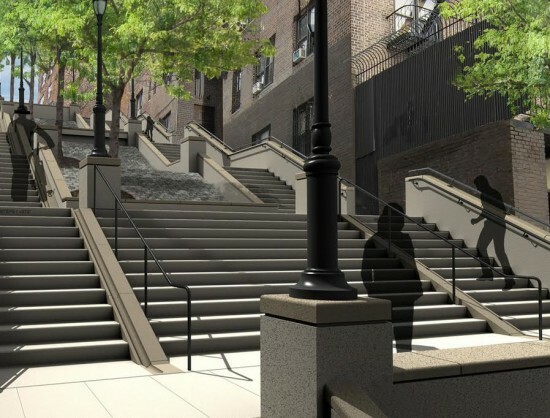 These fixtures, developed by the Department of Design and Construction and the Department of Transportation, are the latest of these efforts to make gritty city a bit greener and more civilized.